Somewhere along the line, I ended up with a Better Homes and Gardens subscription. I seriously can not recall why or how I got on this list, but I am not complaining. It has been a refreshing magazine to flip through each month, providing endless decor inspiration and ideas for simple, healthy meals. When I am not deep in imagination about using their suggested paint combinations or planning out some new weekly meals, I gravitate towards their imaginative ways to organize a home. 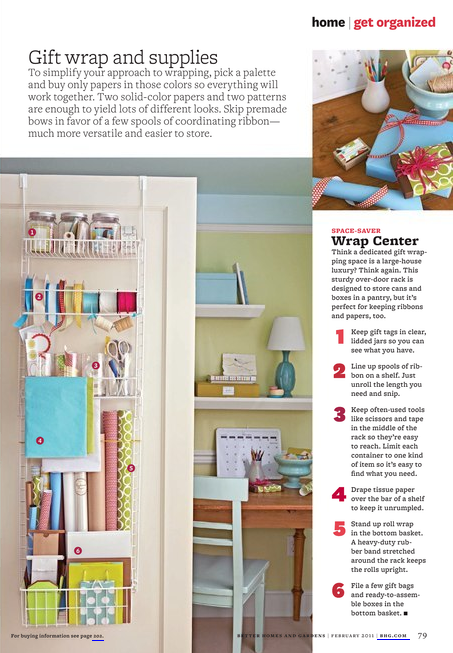 While it's a magazine meant for someone in a larger home, they take a small-home approach to their tips and tricks for cleaning up clutter around you. Ingenious. 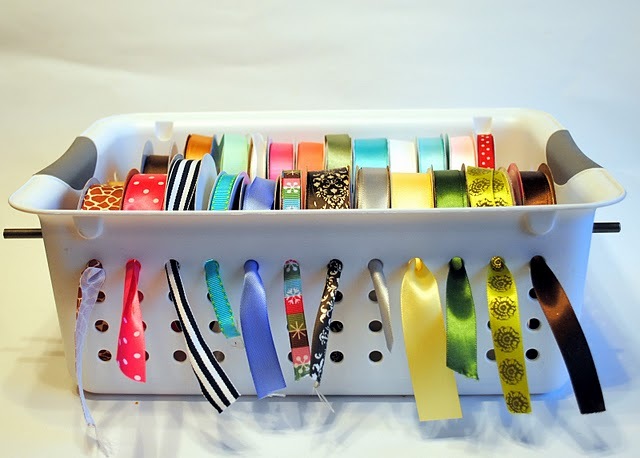 Using an over-the-door pantry organizer that you can find at most home improvement stores or online catalogs, and organizing the sheer chaos that is gift wrap supplies. I am in love. I particularly like how they hang the tissue paper over the front to keep it clean and crisp. While we have taken advantage of most over-door space in the condo for things like a robe hanger in the bathroom and a scarf-and-apron hanger in the kitchen/coat closet, this is something I would use in a heartbeat in a larger home.